After almost 25 years the fabled goats of Es Vedra have now been eradicated from the small islet that lies off the west coast of Ibiza. 5 females and 1 male were introduced to Es Vedra in 1992 however the Balearic and Island governments have now decided to get rid of them to “recover the native flora of the rock”. After consultation it was decided that the best way was to kill them rather than remove them so yesterday (4 Feb 2016) environmental agents sailed over to the islet and at 8am began shooting all the helpless creatures. By 2pm their grisly task was complete although they will return today to ensure that none were missed in the cull. The slain animals will be left on Es Vedra to decompose naturally as it was also deemed too dangerous to remove the carcasses even though this is technically against the law (according to Ley 8/2003 de Sanidad Animal). Caterina Amengual, Director of Natural Areas and Biodiversity for the Balearic Department of Environment (belonging to the environmentalist coalition ‘MES per Mallorca’) said “it’s a question of priorities and the conservation of ecosystems is a priority. We have an obligation to protect natural areas”. Some local residents are very upset about the decision especially as the same government recently proudly announced that the Balearics were ‘anti-bull fighting’. Ibiza residents are well known for their love of all animals so they are decrying this as double standards. 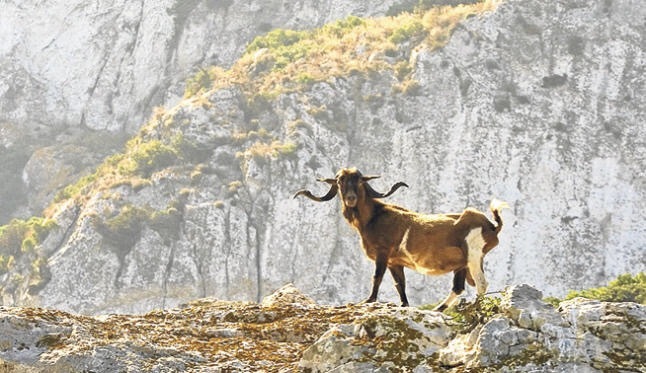 The goats of Es Vedra could be clearly seen from sailing vessels and were part of the myth and aura of the rock. I myself have spent many hours moored around Es Vedra trying to convince friends aboard that the goats actually existed. Sometimes we left without seeing them but many times we were able to spot some of the herd carefully traversing the steep rock face. It’s an extremely sorry end to a story that I often told and always put a smile on my face (especially when I was proved right over the doubters). The Balearic & Ibiza government have been unequivocal in saying that this was the best course of action in protecting one of Ibiza’s most famous landmarks but a small light has gone out on the mythical rock and you can’t help thinking they have taken the easiest and cheapest option. Delivering death to Es Vedra is not good Karma but the environmental experts know what they are doing after all, don’t they?